Mum was an amazing woman – a tea, poetry and Chopin nocturnes kind of a woman. But since her grand piano didn’t fit in the kitchen, she felt neither did she. So I guess it was inevitable that I could legally drive a car before I could successfully boil an egg. In my world olive oil came from pharmacies, its uses strictly medicinal, and Aromat was the only thing you needed in your spice rack, other than salt. And so I started my exciting food journey, totally clueless. Cooking, tasting, classes but, most of all, reading. Because if one can read, one can cook. Not fancy, gourmet Michelin-star stuff of course. Just plain food – the kind you want to cook and eat again and again. I cook soul food, comfort food and, most importantly, CHEAP FOOD. Because, see, I’m just a little bit cheap. Not the red lips/high heels/Sea Point Main Road kind of cheap. Rather the kind that buys tekkies at Pep and gets a borderline-weird thrill at the thought of a buy-1-get-1-free special on pumpkin. As much as I love reading cookbooks, I like experimenting with my own recipes even more. I’m a real ‘what if’ cook. What if I make pizza dough but use wholewheat flour instead of just plain? What if I swop mozzarella for goat’s cheddar? What if I top it with rocket with just a hint of walnut vinaigrette? And add toasted walnuts for good measure. Will it work? Not the foggiest. 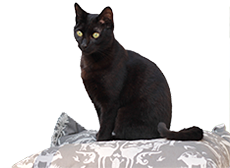 Then I grab my apron and call Merlot, my mad black rescue cat from the Grassy Park SPCA, to come keep me company. She’s pretty attitudinal for such a small creature. Obviously doesn’t fully appreciate that I singled out her little diarrhoea-plagued self, when I could have had my pick of any of the 50 other cuties vying for attention. Together we cook up a storm in our teeny-tiny Cape Town kitchen. My gran’s chicken pie and souskluitjies. Her old-fashioned ice cream made with Ideal milk. But also other stuff. Loads of French-inspired dishes, because I have a grand amour for la belle France. And dishes that suggest many hours of unbecoming sweaty slaving, while in reality I just chucked a few things in a pot and put my feet up with a trashy romance novel and a glass of chardonnay. I’m a freelance recipe developer, food stylist and food photographer. 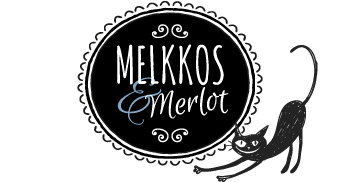 Melkkos & Merlot is my blog baby, my space where I can experiment freely with new recipe ideas and share old favourites. 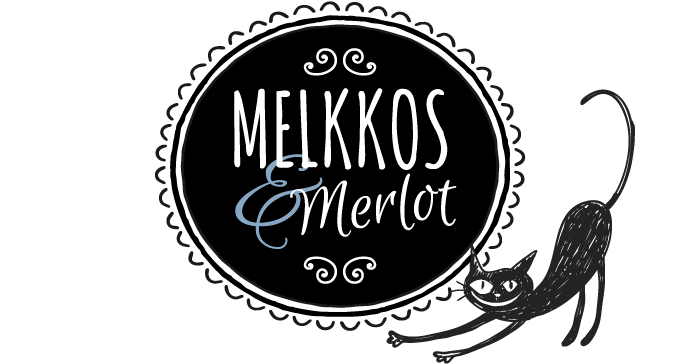 And because I spent an awful lot of money at the Cape Wine Academy learning to be a fancy lush, I share a bit of that too.